Below you will find all condos for sale in Park City's Deer Valley Ski Resort communities. Deer Valley real estate is divided into four areas that include Deer Crest, Lower Deer Valley, Upper Deer Valley and Empire Pass. In Deer Valley you will find many options and a wide range of pricing for condos for sale. The major factor in pricing will be based on location. Lower Deer Valley will offer some of the most affordable condo properties, and the ski-in, ski-out neighborhoods such as in Empire Pass will command a much higher price. Empire Pass is the newest community of Deer Valley and within this newer real estate development there are many more recently built, ultra high-end, luxury mountain lodges. The Montage is one of the newest additions to Deer Valley and offers an unparalled ski-in, ski-out mountain luxury resort and spa. 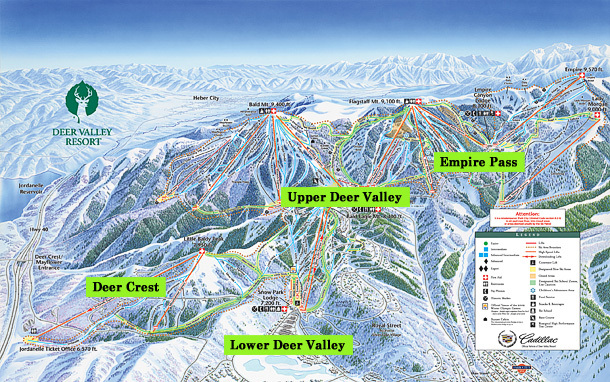 Here you can easily browse the selection of slopeside ski condos for sale at Deer Valley ski resort. Home buyers can choose from ultra luxury condos in St. Regis Deer Crest or The Montage in Empire Pass. Other condos choices that offer ski-in, ski-out access would include The Grand Lodge, Silver Strike Lodge, Arrowleaf and Flagstaff Lodge. Deer Valley is well known as the premier ski resort for luxury slopeside accomodations such as long time favorite Stein Eriksen Lodge. With new additions at Empire Pass and the St. Regis at Deer Crest, there are now many amazing choices to consider. As the #1 ski resort for an amazing 5 years in a row, there is no better place in North America to own a luxury condominium! The Montage does not map correctly on our search so to view all Montage condos for sale please click here. Read about the variety of condos available for sale at Deer Valley. Browse luxury condos for sale at Deer Valley below or contact Heather Peterson & Sean Matyja for more information about Park City real estate. Looking for a Particular Style of condo at Deer Valley? Deer Crest is a private gated ski-in, skiout community at the east end of Deer Valley Resort. Mostly made up of luxury homes, this community does offer a few townhomes, and the only real condo offering is the famous St. Regis condominium hotel. St. Regis Deer Crest was a game changing property for Park City and Deer Valley. With the emergence of such an elevated property, it has brought many new people to the Park City area. Many of whom now call Park City home. The hotel is located within the private gates of the Deer Crest community, and cannot be accessed by car for the public. Situated on two large parcels of land, The St. Regis Deer Crest Resort is connected by a side-by-side fenicular (railway tram) to a lower lodge that allows public access to the hotel and its amenities. The beautiful hotel includes slope-side private residences, condominium suites, and a total of 181 custom-designed rooms. For connoisseurs of quality, St. Regis Resort & Residences offer unparalleled hospitality. In the newest location slope-side at Park City’s Deer Valley Resort, guests enjoy a unique and extraordinary lifestyle of luxury while perched high among Utah’s renowned Wasatch Range of the Rocky Mountains. Click here to view all Deer Crest Deer Valley condos for sale. Lower Deer Valley offers the most affordable choices for condos for sale in Deer Valley. These condos are located near the base village of Deer Valley's Snow Park Lodge. many fo these condos offer easy walk to skiing, as well as walking to the fun summer events and summer concert series held at Snow Park Lodge. Also with this lower elevation location, it is easy to catch the free Park City bus to popular Main Street for dining, shopping and night life. There is a wide range of options to choose from in Lower Deer Valley. The Pinnacle townhome are large, with open floorplans, big views and many people live there full time as well as using them as second homes. More affordable options would include the Queen Esther townhomes or Glenfiddich. Boulder Creek, Stonebrige, Aspen Wood and In The Trees are all right on the free bus route. The premier location in Lower Deer Valley would be the slopeside Black Diamond Lodge. A highly coveted location, the Black Diamond Lodge is nestled into the mountainside along the ski runs and is right out front of Deer Valley's world famous ski school. And in Summer, you can watch the Summer Concert Series right from your luxurious condo balcony overlloking the crowd and stage. Click here to view all Lower Deer Valley condos for sale. Upper Deer Valley has long been the most coveted location for ski vavaction condo ownership in Park Citys Deer Valley Resort community. The absolute best location has always been Silver Lake Village, whch is Deer Valley Resort's mid-mountain village offering shoppng and dining. Condos near the Silver Lake Village can easily walk right over to ski access, as well as walk over to dinner in the evening. The premier property in Silver Lake Village in the world renowned Stein Eriksen Lodge. Other popular choices would include the other ski-in, ski-out properties such as Stag Lodge located alongside Deer Valley's "Success" and "Last Chance" ski runs. Stag Lodge also offers amazing views overlooking all of Upper Deer Valley and out to the mountain peaks above Empire Pass. The direct ski access condos will sell for the highest pricing, but there are many great condo and townhome options that require only a few steps or a short walk to skiing. The Cache townhomes are quite popular and well located. The Chateaux at Silver Lake is only right across the street from skiing at Silver Lake Village and sell for far less than nearby Steins. Click here to view all Upper Deer Valley condos for sale. The newest area of real estate development in Deer Valley is Empire Pass. Empire Pass is a community of ski-in ski-out homes, lots and condos master planned by Talisker. Most of the property sold in Empire Pass will include the purchase of the Talisker Club, which is a private club for members offering many amenities at Deer Valley ski resort as well as out at the Tuhaye Golf community. The Village at Empire Pass inlcudes the condos for sale at Silver Strike Lodge, Arrowleaf Lodge, Flagstaff Lodge, Shooting Star, and the townhomes at Larkspur. The Village is also home to Talisker's Tower Club, centrally located alongside the Silver Strike chairlift. Further up Empire Pass you'll find The Grand Lodge at the base of the Northside Express chairlift, offering easy ski-in, and ski-out access. Near the top of Empire Pass resides the stunning, luxurious Montage Hotel at Deer Valley. The Montage raises the bar for what a luxury mountain resort and spa should be. For the upmost in luxury ski-in, ski-out property, be sure to search through the listings for sale in Empire Pass. Click here to view all condos for sale in Empire Pass. Need More Info About condos for sale at Deer Valley Ski Resort?